We are an Australia-based, family-owned business specialising in producing quality organic Kefir grains. Here you can purchase the freshest Kefir grains you will ever find in Australia! We sell kefir grains only fed with organic foods with free Australia-wide shipping available. If you haven’t decided where to buy kefir so far, you’ve come to the right place! Kefir is a fermented milk drink. 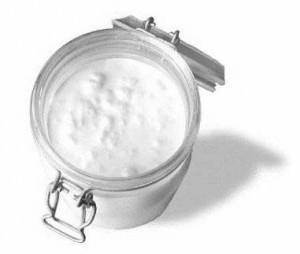 The word kefir is said to have originated from the Turkish word “Keif” which means “good feeling”. Kefir dates back many centuries to the shepherds of the Caucasus Mountains who carried milk stored in leather pouches where it would ferment into fizzy sour yoghurt. Elie Metchnikoff, a Nobel-prize winning biologist at the Pasteur Institute, first suggested that lactobacilli might counteract the putrefactive effects of gastrointestinal metabolism in 1908. He attributed the long and healthy life of the people of the Caucasus Mountains to their consumption of soured milk. In modern times there’s a great deal of interest and research into probiotics and the health giving properties of fermented milks like kefir. There are two types of kefir: water kefir – small transparent grains that ferment sweetened water; and milk kefir – white or cream coloured grains that look rather like cauliflower florets that ferment milk. Kefir is a living culture, a complex symbiosis of more than 30 microflora that form grains or cauliflower-like structures (sometimes called plants) in the milk. As the culture ferments the milk these structures grow, creating new grains in the process. Real kefir from live culture is an endlessly self-propagating process. Microorganisms present in the grains include lactic acid bacteria, Lactococcus lactis subsp. lactis, Streptococcus thermophilus, Lb delbrueckii subsp. bulgaricus, Lb helveticus, Lb casei subsp. pseudoplantarum and Lb brevis, a variety of yeasts, such as Kluyveromyces, Torulopsis, and Saccharomyces, acetic acid bacteria among others. They give kefir excellent keeping qualities by keeping putrifying bacteria that might otherwise colonise the milk at bay. They’ve been shown to inhibit both salmonella and E. Coli in laboratory tests. Kefir has many reputed health benefits. It has antibiotic and antifungal properties. It’s been used in the treatment of a variety of conditions, including metabolic disorders, atherosclerosis, and allergies, tuberculosis, cancer, poor digestion, candidiasis, osteoporosis, hypertension, HIV and heart disease. You might find it odd that that a drink containing yeasts would be good for treating candidiasis but it has been helpful to many people, both by restoring a better balance to the gut flora and because some elements of the microflora will kill off Candida Albicans. Not all yeasts are harmful. In addition to beneficial bacteria and yeast, kefir contains many vitamins, minerals, amino acids and enzymes. Particularly calcium, phosphorus, magnesium, B2 and B12, vitamin K, vitamin A and vitamin D. Tryptophan, one of the essential amino acids abundant in kefir, is well known for its relaxing effect on the nervous system. Because kefir also has an abundance of calcium and magnesium, also important minerals for a healthy nervous system, kefir in the diet can have a particularly calming effect on the nerves. The abundance of enzymes brings more health benefits, especially to lactose intolerant people, many of whom can tolerate kefir without difficulty, as long as the kefir is raw and not cooked (cooking destroys the enzymes). 2019 Kefir Grains Shop Australia. All rights reserved.